the Breifne Historical Society, deals with the local history of Counties Cavan and North Leitrim. 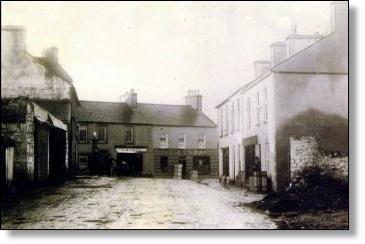 The returns from the 1901 Census of Drumkeeran indicate that the town consisted of five streets; Main St, Market St, Church St, Chapel St and Back St. The returns give the names and the occupations of those who resided on those streets on the night of the census, 31st March 1901. The total population of the town on the night of the census was 273. This number includes everybody who was resident in the town that night, including servants, visitors, lodgers etc. Looking through the list of occupations as recorded in the returns we get a very interesting insight into the social and business life of the town at the beginning of the 20th century. Looking at people’s occupations we see that the biggest group with a total of 30 is that of "servant". Included under that term are those who are recorded as "labourer", but not included are those who were recorded as "shop assistant" etc. The large number of servants recorded for Main St and Chapel St is explained by the fact that many shopkeepers hired a servant to help in the household tasks. All of these servants were resident in the houses where they worked. The next group is that of "shopkeeper", numbering 15, but if we include those who described themselves as "merchant", the number rises to 18. "Farmer" is next, numbering 14. This number includes both those who owned farms of land and those were are recorded as farm labourers. Allan Nixon (54), the post master who lived on Main St, was also the Clerk of Petty Sessions. Joseph Gallagher (30), who lived with Terence Kelly on Market St, was recorded as a “photographic artist”. Francis McNamarah, a lodger with Mary Flynn on Chapel St, was described as an “umbrella repairer”. Using the following the links below visitors can read a more full list of names and occupations for each street. Ages are shown in brackets and the spellings of names are as they appear on the census returns.